Isn’t it fascinating when you find power tool pros suggest a model from your best cordless brad nailer list that you compiled after tireless research. Will it be a coincidence to find Ryobi P320 in that list? Whatever the matrix you choose to find best cordless brad nailer, we are confident P320 Airstrike 18V One+ Cordless Brad Nailer from Ryobi will definitely stay on the list for favorite models. We have very good reasons to back our claim and we like to share our findings with you that might be helpful to understand best and worst features, specifications, where it can be used and finally is it the right nailer for you. Let me start with a confession I have been bit sceptic of cordless nailers. I had doubt how nailer can work without ample (compressor) pressure that makes you feel secure on the site. Being said that, the thought of dragging out a compressor and 50-foot air hose just to nail up some trim molding or put together some custom built-ins also came to my mind so many times. Which led me to take cordless brad nailer seriously. Biggest benefit of battery powered tool is it eliminates most drawbacks of pneumatic tool and Lithium-ion battery is a real game changer as the technology is matured, it now generate similar level of power of its pneumatic counterpart. If you are in finish or trim carpentry that involve lot of nailing than this is the product you will be looking for. Ryobi hsa finally found the missing piece of the puzzle that most of the customer are looking in a cordless nailer which is PRICE. Making a tool with a Lithium-ion or NiCad battery make them pricey which is also true for cordless brad nailer. Ryobi P320 Airstrike 18V One+ Cordless Brad Nailer is sold as bare tool to give you price advantage over other model and allowing you to gradually build your ONE+™ collection without spending additional money on batteries and chargers with each tool purchase. Not only that you can choose either Ryobi 1.5 Ah or 4.0 Ah batteries sold separately to power Ryobi P320 based on your naling need. I liked the idea of forward compatibility Ryobi implemented on P320, it basically give you the option to upgrade battery technology upto lithium-ion or LITHIUM+™ batteries for lighter weight and better performance. Why this is important, in most cases power tool brands like all other businesses would promote new product while Ryobi made P320 to be relevant and functional for long time. Ryobi P320 is a part of 18V ONE+™ System introduced by Ryobi as next generation cordless nailer specifically made for user convenience. AirStrike™ technology enabled 18 gauge brad nailer work without noisy compressors, bulky hoses or expensive gas cartridges to drive brad nails. With less things to carry on, you get faster setup and easier maneuvering on the jobsite. Ryobi claims the new and improved P108 4Ah High Capacity LITHIUM+™ battery (sold separately) can drive up to 1,700 nails per charge and tackle virtually any trim job with nailer speed of 60 shot per minute. You can hardly find any finish and trim job where Ryobi P320 cannot be used, Its powerful motor can drive 18-Gauge brad nails from 5/8 in. to 2 in. long, used in various applications like door & window casing, door jambs, baseboard, crown molding, cabinetry, cap and shoe molding, staircases, door and window trim, chair rail, brickmold, hardwood flooring, paneling and furniture making. This nicely designed brad nailer is impressive not only on the outside but also inside. Other than the convenience of battery power and proven driving capacity, P320 also has unique feature like Dry-fire lockout, dual firing mode, depth adjustment, dual LED lights. The RYOBI P320 AirStrike Brad Nailer is like dream come true for those seeking comparable cordless brad nailer from Dewalt, Hitachi, Makita but at half the price. We have plenty more to share on Ryobi P320 Airstrike 18 Volt One+ Lithium Ion Cordless Brad Nailer, find out is this the right brad nailer for you. Ryobi packaged this product to be sold as bare tool. So you are not going to find battery or charger supplied with it. most career carpenters expressed tool weight isn’t a issue when you compare with the convenience of a cordless tool. As we mentioned earlier you only get the bare tool, Ryobi P320 packaging may include followings. 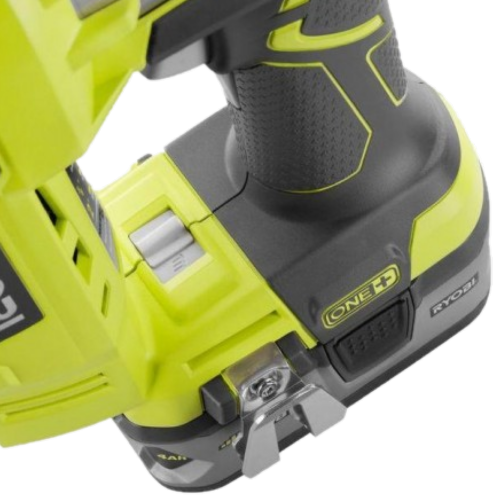 At first glance I can tell you one thing Ryobi design team spent a lot of time creating a cordless brad nailer that is stylish and functional at the same time. P320 part of the RYOBI 18V ONE+ System features over 100 unique products but all have one thing in common, outer shell of all products have the combination of blue and green ( I think it’s more like lime). Who could thought power tool can have colors other than the traditional black and dark yellow combination. It’s kind of a brand statement to differentiate Ryobi product from competitor and I like it. Now every single bit of green color you see on the P320 is hard reinforced plastic and rest of the body has blue color which is actually rubberized overmold for optimum grip and user comfort. You will notice that control switch such as trigger, depth of drive adjustment, air pressure dial, mode selector and jam release latch all having same color is easy for user to find out. Our overall impression is it have sufficient build quality and ergonomic design to be considered for home and professional users. It may arise in your mind that this cordless brad do the same thing like a pneumatic brad, drive brad nail in trim job. Yes both perform same function but the technology and way it work is different. Key difference with Ryobi Airstrike technology is you will experience slight delay after pulling trigger, whereas a pneumatic nailer fire instantly. Ryobi’s quiet motor has to do a short cycle of ramp-up before firing the nail. I like to assure you that this delay is actually shorter than some gas-powered nailer we’ve reviewed before. Thing is after firing 10-15 shots you will get used to it as thats happen to be in our case. With P320 you can independently adjust both air pressure and depth of drive. This is the first cordless brad nailer we handled with this unique feature. While most brad nailer rely on depth of drive adjustment to set how deep the nail will sink depending on the nail length and the material you’re nailing into. P320 air pressure dial let you regulate air pressure to shallow or deep drive of nail. If you are not getting the desired depth than you can use depth of drive wheel to do your job. Infact Ryobi primarily recommends using air pressure dial for depth adjustment. Job you can get done by the Ryobi P320 impressed us. Our test carpenter reported mode selector switch really work well with Airstrike system. They got impressive result in countersinking 2” brad into various wood material like birch, pine and maple using sequential and contact actuation mode with great consistency. They even called it more consistent than pneumatic brad. On top of that battery-powered air supply reduce fluctuation between shots. Do precision nailing or fast nailing you get reliable shot whatever firing mode you choose. 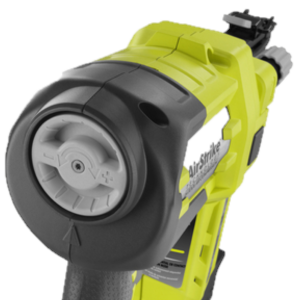 Dry-fire lockout is treated as one of the must have feature that every expert look in a brad nailer whether it’s pneumatic, gas or battery-powered. We noticed even top brands sometime overlook this ideal nail gun feature. But don’t worry Ryobi P320 has it, and it’s work perfectly. The system kicks into action when 0-5 brad nails left in your magazine. Once the dry-fire lockout system is activated you can still pull the trigger as long as you want but it won’t mar your wood as it only deliver air from the shots. Load the magazine with another round of nail, and you’re good to go in the nailing business. While LED light itself is commonplace but what functions it perform in Ryobi P320 is unique. Ryobi equipped the tool with twin LED light on each side that shines directly right where you’re nailing. Other than illuminating work surface LED lights also provide feedback to indicate whether the battery pack is charged sufficiently and/or if the tool is functioning properly. You’re going to like the tool-free jam release on the P320. Easy to clear front nose assembly has a latch on it. You can open up the front nose and expose the nail driver by simply lifting the latch. We however noticed Ryobi instruction manual indicate use of a flat screwdriver into the tip of the driving mechanism and push the driver mechanism back to free the nail jam. During our testing, we didn’t have to use the feature so we cannot confirm the indication. Mark my words, the integrated belt clip will be your best friend when you start to use the tool more often. Its wide enough to fit with thick as well as traditional belt or waist bands. You can install it on the right or left side the nailer depending on your preference. Make sure to have phillips head screwdriver to tightly secure the belt clip with the nailer. 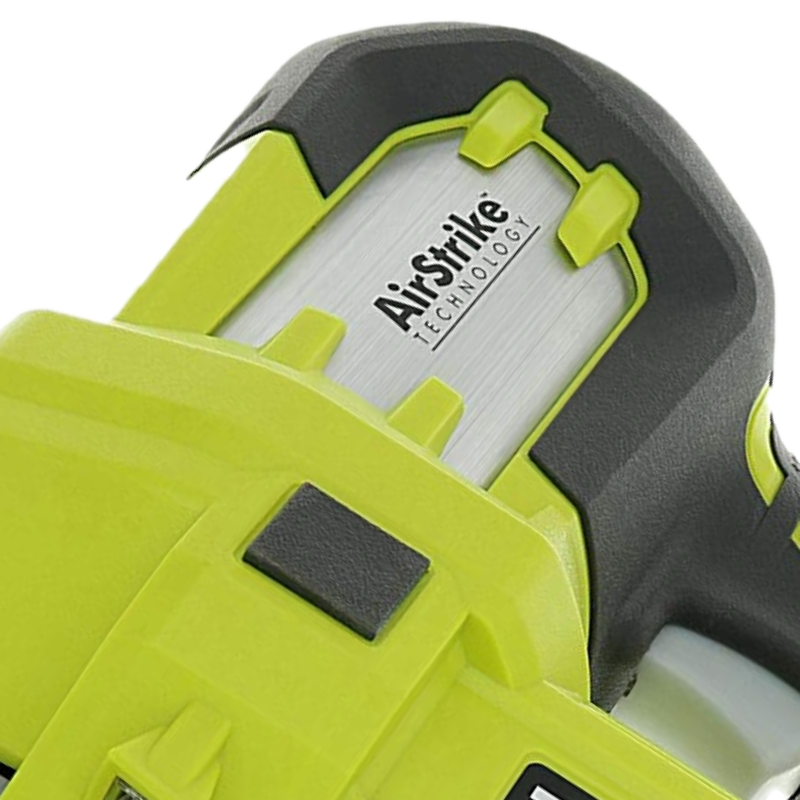 You will find Ryobi attached a removable non-marring pad on the nose Airstrike that helps prevent marring and denting when working with softer woods. Another replacement tip is also supplied with the gun, stored in the on-board storage located on the magazine of the tool. The tool is also sufficiently covered with bumpers to set down your gun on any surface without the fear of scratching it. This is truly a 18 gauge finish nailer that has comparable power to some gas-powered nailers and the convenience of a cordless power tool. You can rely on P320 practically for any fastening work around the house, roofing tiles installation, reinforcing joints are few example of its capabilities. We can name few other areas like finish work, trim, crown, baseboards, and other light materials where Ryobi P320 definitely going to shine. However we do not recommend this gun for structural work as 18 GA brad nails don’t have enough holding power. Homeowners will find great value of their money from this feature rich brad nailer. Professionals going to enjoy the tool installing trim work and other household repairs when they add 4.0 Ah 18V battery from Ryobi One+ System that promise to fire up to 700 nails on single charge. Forget about everything we praised about Ryobi P320 when you can find its worthiness from real customer reviews. Lucky for us it’s buyers are lining up to give 5 star rating. Our team gone through over 2200 customer reviews to understand their feedback on the tool. Don’t get excited just now, not everyone is happy or positive on P320. Around 10% customer gave negative review or 1 star rating. We agree with other 90% reviewer who are satisfied with their purchase of Ryobi P320 Airstrike 18 Volt One+ Lithium Ion Cordless Brad Nailer. Ryobi has earned a good reputation for their value based product but that doesn’t prevent them launching new product with higher standard and performance. Ryobi P320 is an example of that direction. I am not going to invoke the fear of dragging compressor and hose to show how this cordless brad is better than pneumatic brad nailer, because it doesn’t need one. The reasonable price point of Ryobi P320 is enough to catch your attention. If that doesn’t rock you, use of P320 for virtually everything, from making furniture to home improvements will surely make you think twice.